Updated: 2018 FIFA World Cup, also the 21st FIFA World Cup, takes place in Russia from 14 June to 15 July. The host Russia kicked off the footall party with 5-0 convicing win over Saudi Arabia. The final will include 32 national teams and take place on 15 July in Moscow at the Luzhniki Stadium. Soon, you'll be able to free download 2018 World Cup video from YouTube and other video sharing sites and sports sites with free YouTube downloader. Crazy for the 2014 FIFA World Cup Brazil - The 2014 FIFA World Cup brought the world's fans amazing matches one after another. How about the fantastic scoring performance of Lionel Andrés Messi, who ran about 8169 metres in the battle between Argentina and Bosnia and Herzegovina to finally gain his second World Cup goal? Enchanted by the top matches from 2014 World Cup, like Spain 1-5 Holland, Brazil 1-7 Germany? The much more interesting and exciting matches are yet to come in 2018 World Cup. Watching the fantastic matches, drinking the beers and cheering for your beloved football player, how wonderful it will be! But life is not always a bed of roses. If you don't have the heart to miss any marvelous match, you may have to wait for the live match around your TV or computer anytime. But this football event lasts as long as one month. 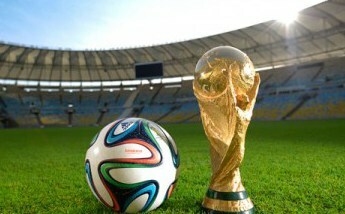 So it seems a little bit challenging for you to watch 2014, 2018 FIFA World Cup live video without any interruption. Assuming that you miss some highlights about World Cup Brazil 2014, 2018 World Cup Russia to some reasons, no biggie, you can still download them from YouTube to review them on your iPhone iPad and Android devices when sitting on the bus or subway on the way home or to excursion. It enables to kill your boring time on the road, but also provides a visual feast of football match. Trigger your interest to change a way for watching World Cup video? To watch plenty of 2014/2018 World Cup exciting moments on portable devices, what you need to prepare is merely concerning a fascinating yet multifunctional video converter. Here one tool named MacX Video Converter Pro is the very qualified one, which can satiate your needs to download any video about 2014 FIFA World Cup, no matter the HD video of Brazil VS Croatia, Spain VS the Netherlands or Argentina VS Iran from YouTube, Vevo, Vimeo, Dailymotion and other 300 video sharing sites in 4K UHD, HD 1080P, 720P, SD and convert video to MOV, MP4, AVI, etc for playback on iPhone, iPad, HTC, Samsung and more. Provided you are eager to download 2014, 2018 FIFA World Cup official Song - Todo Mundo by Gaby Amarantos & Monobloco, the well-received We Are One Ole Ola and the popular Dare (La La La) by Shakira, it will shock you at its blistering speed that it only costs 30 seconds to call them done. And the video quality is reserved without any quality loss attributing to its High Quality Engine support. Free download the World Cup video downloader for Windows or for macOS. Click the "YouTube" icon on the top, copy and paste the World Cup video URL to the type box, click Analyze to load video. The program supports batch World Cup videos downloading. After the 2014/2018 World Cup video is loaded, a Window will pop up, allowing you to select video resolution, format, codec, and file size. Pick the one you want and click OK to make the settings valid and close the window. Click "Browse" button to choose a folder for the 2014, 2018 World Cup YouTube videos. Click Download Now to start processing World Cup video download on your computer. After the process is finished, you can transfer the World Cup video to iPhone, iPad, Android mobile devices, USB, NAS, HDTVs etc. It is also able to download World Cup theme song of MP4 HD, MP3 from YouTube, SoundCloud etc. music sites in batch, like Shakira World Cup songs, Brazil Russia World Cup official songs. Tip: World Cup video downloader also supports downloading other videos, movies, music, trailers etc and convert them into a glut of HD & SD video formats, including MKV, M2TS, MTS, AVCHD, H.264/MPEG-4 AVC, AVI, MPEG, MP4, WMV, MOV, FLV, RM, RMVB, WebM, and a lot more, with 350+ preset profiles for mobile devices, including the latest iPhone XS/XR/X/8, Galaxy S8. It also empowers you to record on-screen movements, make photo slideshow and so on at your will. MacX YouTube Downloader helps fans download FIFA World Cup 2018, 2014, of all time videos, highlights, theme song videos, match video, clips etc. from YouTube, Facebook, Dailymotion, Myspace, Vimeo, etc. 300+ sites for offline playback on iPhone, iPad, Android, HD TVs etc.